FLY brings new best value mobile phones in India. 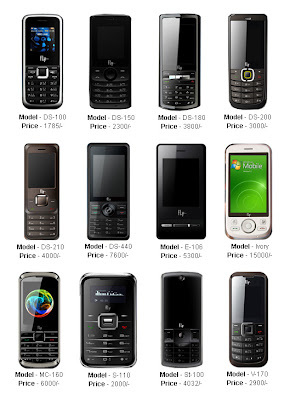 FLY has launched its new low price mobile phones in India with excellent features.FLY DS180 mobile is having capacity of 1000 Phone Book, Megapixcal Camera, Bloothtooth with A2DP and Mobile Tracker. FLY V170 DS phones have Torch,Dual Sim (GSM+GSM),QQVGA CSTN and wireless FM.FLY IVORY handset have Bloothtooth, FM,2.0 Megapixal Camera, Internet. .FLY S110 style mobile phone- sleek designed pocket phone, 1.2" Monochrome Phone. FLY DS440 mobile phone is just 11mm in width and its easy to handle with 2 megapixal camera, FM, the another fantastic feature of this mobile is TV out cable in such a low price TV out mobile is awesome with only Rs.7900..FLY DS 200 has VGS Camera, Dual Sim (GSM+GSM), 26K2 Color TFT,, Wireless FM.FLY ST 110 mobile has Sound Powered by Yamaha,2 Megapixal Camera,Vedio Player,Expandable Memory upto 8 GB. FLY ST 100 is a music centric mobile with 2 megapixal camera, bluetooth, FM, Vedio Payer and with 8 GB Memory. FLY MC160 is a dual sim Touchscreen mobile, Yamaha chipset for music quality, 3.2 Megapixal Camera, FM and FM recording capacity. Eyechatching FLY MC 160 offers 240*320 pixals resolution and 262K color disply, this phone has MP3 ring tones, speaker phone , vedio recording, mobile tracker and 262K. FLY E 106 is touchscreen, TFT screen with resolution of 240*320, 3.2 megapixal camera, FM, MP3 player, GPRS, Bluetooth and more. FLY DS210 isa stylish dual sim phone with 3 MPcamera,8 GB memory card,Bluetooth with A2DP so user can liten wireless music. FLY DS 150 high-tec phone has high capacity battery,MP3 Player,FM with weight of 75gm. FLY DS100 support dual sim, screen resolution of 128*128 pixels display, FM with live recording, GPRS, speaker and MP3 ringtone, support hindi language hindi language SMS/MMS/phone menu.